January 1933 S.A.P. 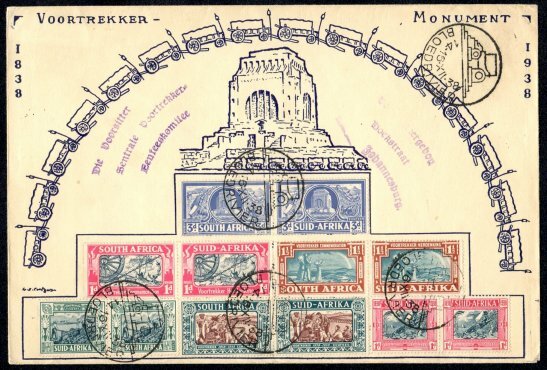 Editorial - Voortrekker Commemoratives in 1936? The suggestion has been made and we heartily commend it, that South Africa should issue a set of stamps commemorating the centenary of the Great Trek, one of the outstanding events in the history of the country. 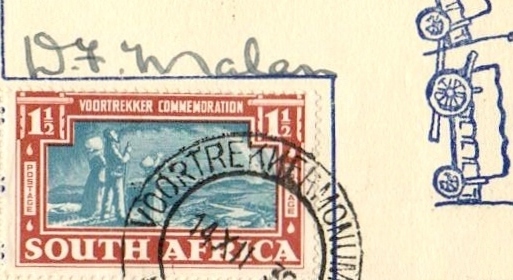 We understand that a committee has been formed to foster the idea and we hope that some leading philatelists will be invited to co-operate........We have observed, during the last two or three decades, a strong tendency on the part of Afrikaners to keep themselves to themselves when celebrating, instead of inviting their fellow South Africans to join in with them. This is a pity, because there is a great number of the latter who appreciate the heroic deeds, bravery and perseverance in the face of terrific odds, of the heroes in South African history. April 1933 S.A.P. We now understand that the commemoration will be held in 1938 and not 1936, the former being the year when the Voortrekkers entered Natal. Meanwhile, there will be issued a set of three Voortrekker Memorial Fund stamps....The design of each stamp will be changed annually during the five-year period.....there will be issued fifteen stamps in five sets of three. Needless to say the ambitious stamp issuing proposal did not come about. 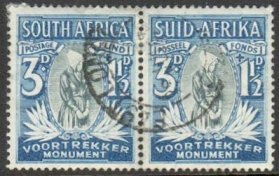 In the May issue under Union Notes it states that a set of three Voortrekker Memorial Fund stamps will be issued on 1 May. It is generally accepted that these values were issued on the 3rd May 1933, but a piece with a clear date-stamp of 1st May 1933 has come to light, thus placing doubt on the original information. 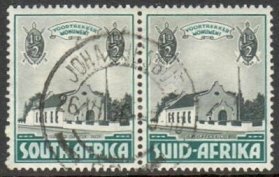 The UK based Stamp Collecting magazine gives the South African stamp policy thumbs down with a heading South Africa Falls for Commemoratives .....disquieting news that South Africa has fallen victim to the commemorative stamp stunt. 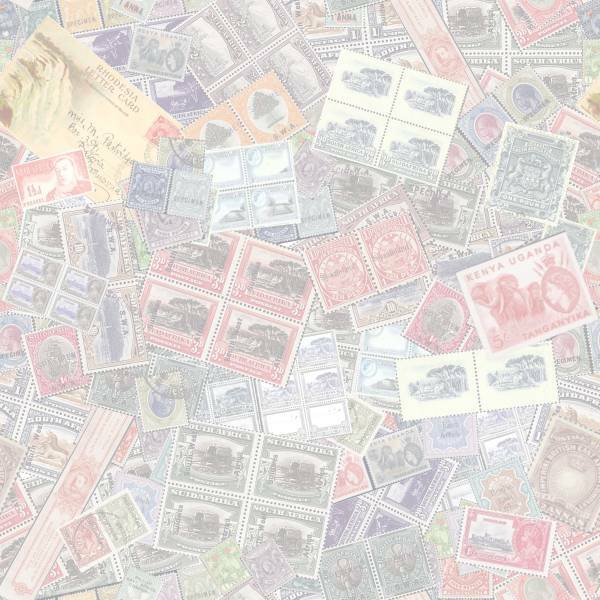 In our May issue, we mentioned the fear that these stamps would not be popular with philatelists and our quotation from Stamp Collecting sustains our view. 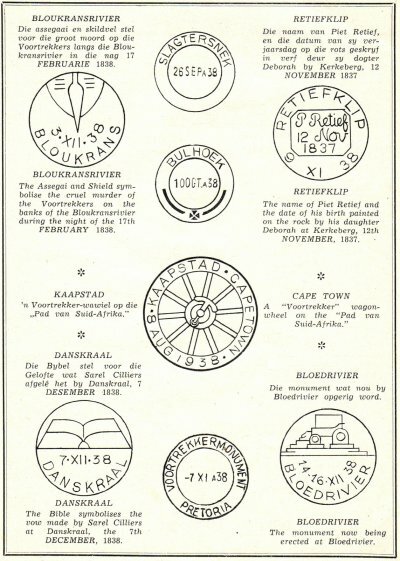 In passing, we may mention that philatelists co-operated with the Voortrekker Centenary Committee in order that well designed stamps be issued, and the support given to the scheme by THE SOUTH AFRICAN PHILATELIST is acknowledged in the official Press bulletins dealing with the issue. 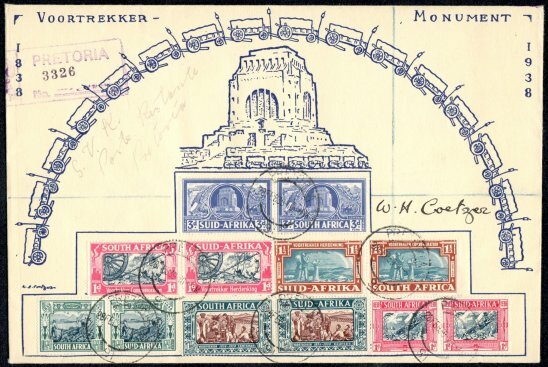 This is the first that we have heard that philatelists co-operated with the Voortrekker Centenary Committee, and we should naturally like very much to know who these philatelists were. It is true that the Committee made reference to the note in our January number relative to the projected Voortrekker Centenary commemorative issue, but we had no idea then of the projected Memorial Fund issue. 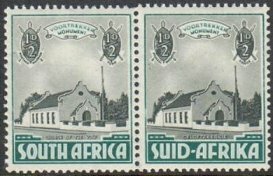 We adhere to our opinion that a centenary commemorative issue would be justified as a national commemoration of the greatest event which led to the opening up of the hinterland of Southern Africa, as well as to commemorate the courage, fortitude and perseverance of the Voortrekkers; but we cannot reconcile ourselves to the Memorial Fund stamps, and we hope that the proposed issues for the next five years will be abandoned. May I draw attention to some points in the designs of the Voortrekker Memorial Fund and the Swaziland stamps. In the 3d value, a Zulu shield is shown on either side of the frame. Behind the shield is shown three assegais, two crossed and one vertical. The latter should have been omitted and replaced by the tufted head of the stick, held in position by the strips of hide passed over and under through the slits shown on either side of the centre, and crossed behind to hold the stick in position. In all three stamps a small cross is shown, similar in shape to the Red Cross, a symbol associated, in peace time, with charitable work. Its appearance on the stamps is meaningless and quite out of place. The latest addition to the Voortrekker series was placed on sale on January 15th. The stamps, which are being sold at double face value, are printed in black and green. The watermark is placed side-ways. The building is The Church of the Vow. In May 1936 under Union Notes there was interest in the history of the church depicted on the stamp. Several queries have reached us asking for more information about this church. The building is in Pietermaritzburg, Natal. It is now no longer used as a regular place of worship but has been made into a museum for Voortrekker relics. "There was no song, no jest heard in that camp, but prayers were poured forth and psalms were sung at every halting place. The army made a vow that if God would give them victory over the cruel heathen, they would build a church and set apart a festival day in every year to commemorate it. The church in Pietermaritzburg and the annual celebration of Dingaan's Day bear witness that they kept their pledge." Dingaan attacked the camp at dawn on Sunday, 16th December, 1888. The emigrant force consisted of 464 men exclusive of the commandants. The enemy was between 10,000 and 12,000 strong. It was estimated that over 3,000 Zulus were killed. The emigrant farmers had only three men slightly wounded. 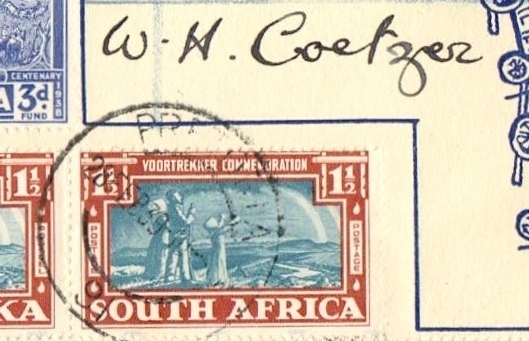 W. H. Coetzer, yet some doubt may be cast as to the accuracy of the foregoing statement as both Prentice and Coetzer are linked to the 1938 Voortrekker stamps. In December next the Voortrekker Centenary is to be celebrated in South Africa. The Voortrekkers, or pioneers, need no introduction here. They were a band of people who, smarting under many grievances, decided to seek independence and pastures new. They were mostly farmers with their families from the Eastern frontier districts of the old Cape Colony and they trekked in parties across the Orange River. Leading a team of oxen in one of these parties was a ten-year-old lad who later became the famous President Stephanus Paulus Kruger, better known as Oom Paul. The main migration, known as the Great Trek, which started in 1834, had assumed large proportions in 1836. By 1838 it had fizzled out. It is estimated that no less than 40,000 emigrants had left the Colony by 1840. The then Governor of the Cape, Sir Benjamin d'Urban, described them as a brave, patient, industrious, orderly and religious people, the cultivators the defenders and the tax contributors of the country. They crossed over into the unknown with their cattle and covered wagons, which were loaded with provisions and necessities, and, in the face of many privations and much suffering, through sheer pluck and perseverance, won through and opened up the interior of South Africa to Western civilization. The thrilling- episodes, culminating in the Battle of Blood River on 16th December, 1838, need not be narrated here. Dingaan's Day is, as everybody knows, a statutory holiday, intended to be observed, as Sarel Celliers meant it to be, as a Day of Thanksgiving, a Sabbath. In 1933 a Central Committee was formed in Pretoria with the object of inaugurating a fund for the election of an appropriate national Voortrekker Monument, which, it was hoped, would be unveiled on 16th December, 1938, on the centenary of the Battle of Blood River and the overthrow of barbarism in this country. This monument is now in course of erection on a chosen site overlooking Pretoria. For propaganda purposes and in order to assist the fund, the Government and the Postal Department were approached at the time with the object of seeking their cooperation. 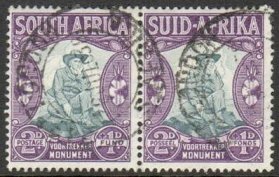 The result was that the issue of special Voortrekker stamps was sanctioned and on 1st May, 1933, three stamps, viz., 1½d, 3d and 4½d, were placed on sale in all post offices. Two-thirds of the value of the stamps represents postage and a third is allocated to the fund. 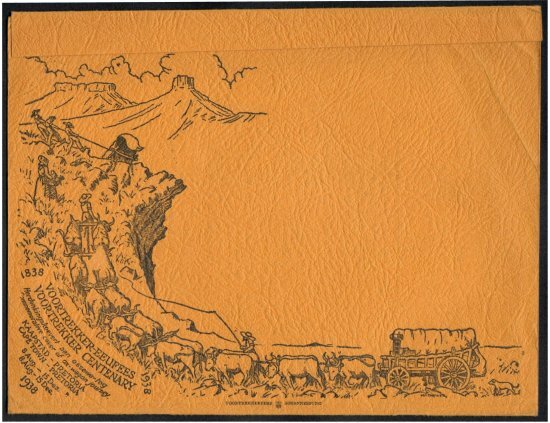 In the selection of designs the committee announced that the place of honour on the stamps should be given to the trekker, his wife, and the ox-wagon. 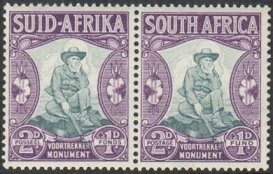 Anton van Wouw 's famous sculpture group, Boervrou en Trekker, provided the necessary inspiration for the designs on two of the stamps, while an ox-wagon appeared on the third. 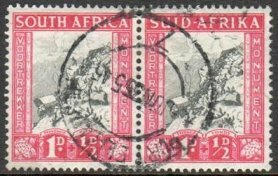 The stamps were printed in Pretoria in rotogravure and issued in sheets of 120 stamps. The details of the designs did not reproduce clearly as the rotogravure process is more successful when the design is of a simple nature. 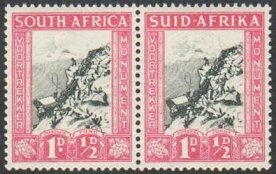 The penny stamp is a photograph from Michell's original engraving of Cradock's Pass which is in the collection of Major Wm. Jardine, of Sir Lowrys Pass, Cape. A similar engraving , varying slightly in design, is to be seen in the South African Public Library at Cape Town. It represents an incident about the year 1840, viz., the crossing of the Cradock Pass, near George. This was long before the Montagu Pass road was constructed. The design shows the difficulties encountered in ox-wagon transport a century ago. It also portrays typical South African attributes. viz., the ox-wagon and span (team) of oxen, kopjes, and aloes. 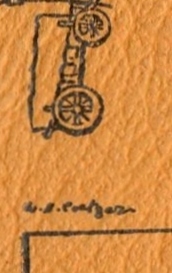 On the two penny stamp is seen a typical trekker with his rifle (Ou Sanna as it was often affectionately termed) gripped in his hand, acting as silent sentry over the laager to guard it against a surprise attack. The ox-hide shields and sharp-pointed assegais at either side represent Zulu weapons, symbolic of barbaric Africa. 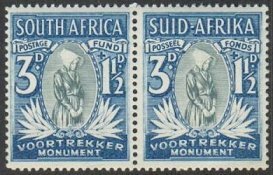 The indispensable boervrou, with her bonnet (kappie) and typical dress, adorns the three penny stamp. On 16th January, 1936, the half-penny denomination appeared. It is undoubtedly the most beautiful of all our stamps thus far printed by the rotogravure process. It is a plain design of the Church of the Vow, which was erected in 1840 on the spot where. 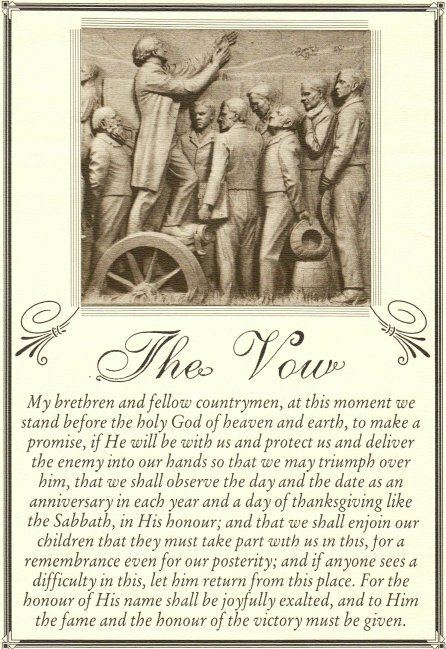 two years before, Sarel Celliers and the trekkers made a covenant that if God gave them the victory they would build a church and consecrate that day as a Thanksgiving Day, a Sabbath for evermore. The building, which stands in Pietermaritzburg, now serves as a museum for Voortrekker relics. It is built of stone (slate) and originally had unplastered walls, with the doors at the sides. To-day, tiles have displaced the original thatch and a porch has been added. It is a solid edifice with gables of the typical Cape-Dutch style of architecture. The Rev. Erasmus Smit, who accompanied the Voortrekkers to Natal, was its first minister. Regular services were conducted in the little church until 1861, when a new church was built beside it. The latter is the Mother Church of the Dutch Reformed Church of Natal, and still uses the original pulpit of the Voortrekker Church. In 1874 the Church of the Covenant was sold, and served less worthy purposes until 1912, when it was re-purchased and restored, as far as possible, to its original design. On 16th December, 1912, the building became a museum for the housing of Voortrekker antiques. November 1935 S.A.P. - Outrage over the Union Voortrekker issue being overprinted S.W.A. Yet another attack is being made by the Government on the pockets of stamps collectors by the unnecessary and uncalled for overprinting of the Voortrekker stamps with the letters SWA. After the long time which has elapsed since the first issue in 1933 of these stamps it is certainly very strange that they should only now be made available for use in South West Africa, and it is doubtful whether a very large proportion of the residents in that territory have any desire or inclination to pay a 50 per cent, increase in postage rates in order to contribute towards the erection of a memorial to the memory of the Voortrekkers in which many of them cannot have any interest. The position probably is that the Government finds that these stamps have not been selling too well (one certainly very seldom sees them on correspondence particularly from the country districts) and has therefore considered that it is desirable that a fresh impetus should be given to their sale, especially to stamp collectors, by means of this overprint. It is unfortunately a fact that no amount of fulmination against this action on the part of the Government will prevent collectors from acquiring these stamps, but nevertheless it is greatly to be regretted that the Government has found it necessary to augment the funds for such a worthy object by such unworthy means. In September the additional two stamps were announced - SG 80 & 81. Both sets enjoyed a two page spread in the November issue. 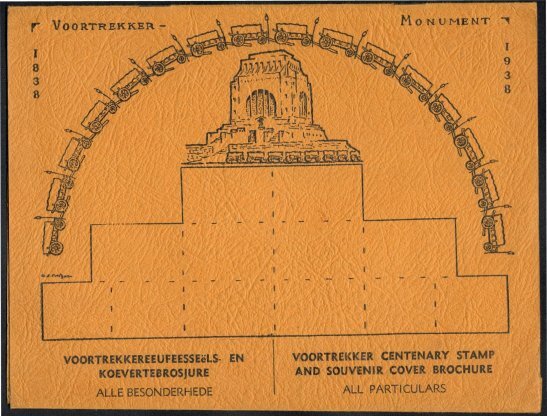 The Post Office issued a Special Commemorative brochure with an orange cover, the front of which depicts the design for first day envelope with space for the eight bilingual Voortrekker pairs issued on 14 December 1938. 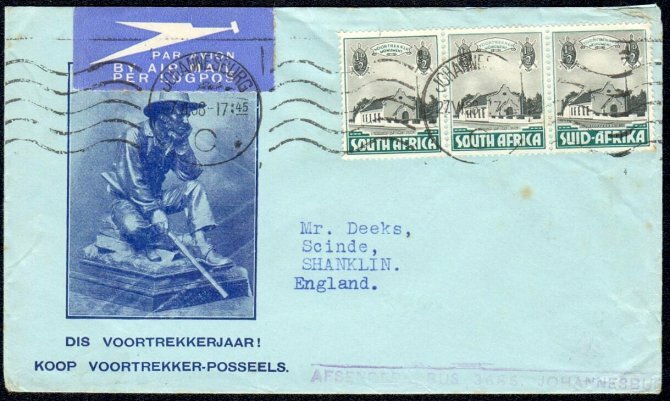 The reverse includes the design of the cover intended for the re-enactment of the Trek from Cape Town to Pretoria and Bloed rivier. From the front there are three pages describing the 1938 designs in Afrikaans. Turn the booklet over and starting from the back the descriptions are in English. 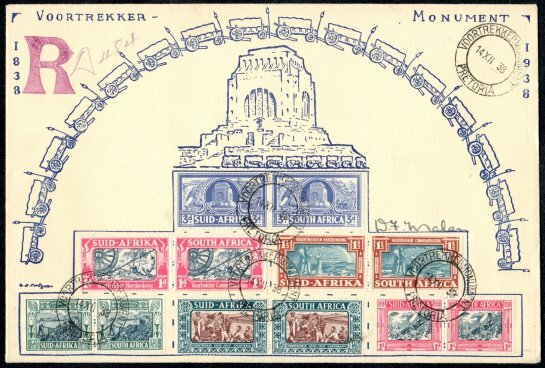 Important Note - The Post Office Brochure stipulates that W. H. Coetzer was the designer of the Stamps and his signature also appears on the front cover of the Brochure and First day envelope - Bottom left below the last vertical Wagon. 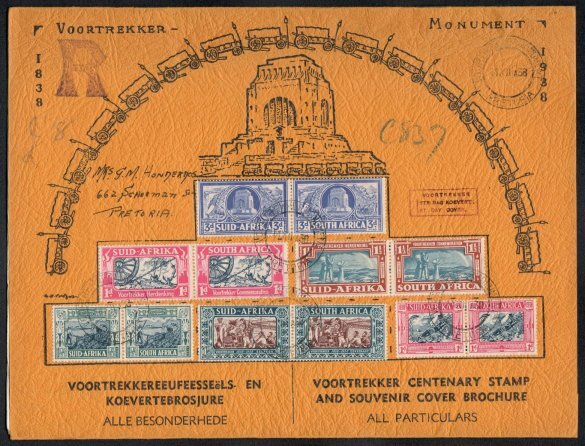 In the centre there is a bi-lingual Post Office advertisement that stipulates the available facilities of two offices at the Monument site during the Voortrekker Celebrations from 14 to 16 December 1938. 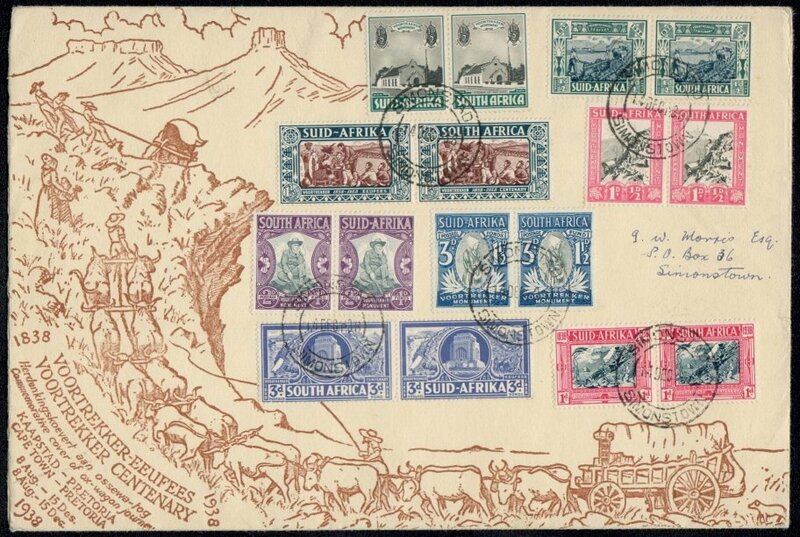 Covers with complete sets of stamps were obtainable at 3s 0d. 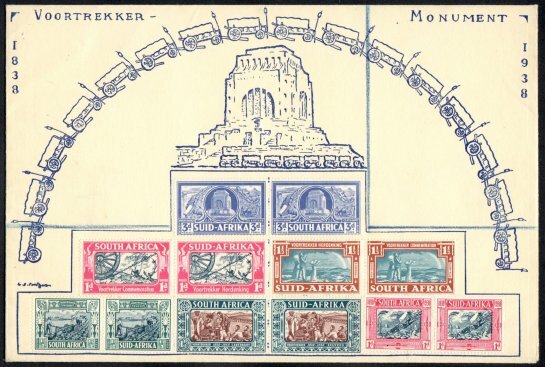 The facing page depicts five special CANCELS for BLOUKRANS, RETIEFKLIP, CAPE TOWN, DANSKRAAL and BLOEDRIVIER plus three date stamps for Slagtersnek, Bulhoek and Voortrekker Monument Pretoria. Trained as a Minister of the Dutch Reformed Church. 1918 Elected to Parliament and in 1925, he was at the forefront of a campaign to replace Dutch with Afrikaans in the constitution and provide South Africa with its own national flag.